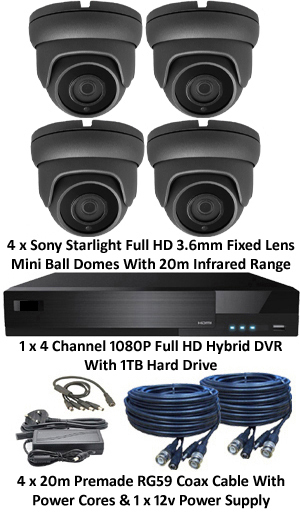 Sony Starlight 3.6mm Mini 1080P Ball Dome 4 Camera System. Several Camera Options. If you are unsure about what system is best for you or you need any advice about recording times, which cameras to use, where to put your cameras, where to situate your DVR, how best to run cables, or anything else you can think of. Please feel free to call James or Kyle on 01748 811991. You do not have to buy online, you can order over the telephone. Great for Home, Office, Shop, Pub, Industrial unit etc. 4 x Sony Starlight 1080P 2MP Mini IR Ball Dome fitted with a 3.6mm lens which will give you a wide angle 82 degree angle lens. Sony Starlight cameras are capable to record in colour during both day and in low light conditions. If you have local illumination from streetlights etc, you will be able to set this camera to operate in colour during the night. This camera has the capability to view 20M at night using infrared LED's when there is no local illumination. Suitable for internal or external use. Can be wall or ceiling mounted. 1 x 4 Channel Full HD Real Time DVR. View live pictures and also playback recordings on your mobile, tablet, laptop or PC. Very simple to set up this feature and full technical support is available if required. Very easy to playback and make copies of recordings. Host of features including alarm input/outputs, motion detection, video loss alarms, etc. Split screen or single screen display options. 1 x 1TB Hard Drive installed into your DVR will give you 1 week worth of recording space for 4 cameras. If you would like more than 1 week of recording space, you will need to select a bigger HDD. (Larger HDD Options are availible in the drop down box). 4 x 20m Camera cables. (Longer options available) These cables take the power to the camera and return the video signal to the DVR. 1 x Camera power supply - There will be a 1 x 12v 4amp Power Supply and 1 x 4 Way DC Splitter, these are used to split the power supplier between your 4 cameras. The DVR will come with it's own power supply. This system can be connected to most TV or PC monitors for local viewing using the HDMI, VGA or CVBS port on the back of the DVR. If you do not want to have a monitor on the system but to be able to view the system via your phone, tablet, PC etc. the TV or monitor will be needed to initially set your phone, tablet, PC etc, but once you have set it up you won't need the monitor anymore and can be removed. If you require audio on your system you can add audio kits that will then add sound to your live and recorded images. Please see under options.